I'm always looking for the perfect pair of denim jeans. For me they are closet staples every woman needs in their wardrobe. You can dress them up or down, and still look polished and put together. 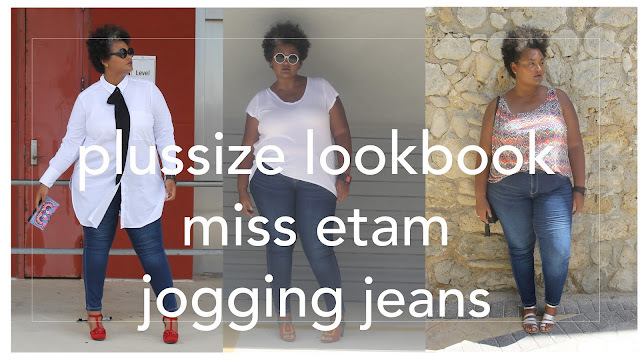 This lookbook features the new jogging jeans of Miss Etam, a slimfit denim with high waist. The material is soft enough to get over my double belly and singe me at my smallest waistband. I did not experience rolling over while shooting. Which is a big plus, I just hate it when trousers pop back under the belly. Another big plus is how the fabric feels against the skin. It feels like jogging fabric but looks sterdy as denim. It is very hot in Curacao, so I would rather wear this jogging material than actual denim. One thing I would like to see, is a variation of color in this range. A dark blue, white , red, black or gray would be great options to have also. See how I styled this pair in 3 minimal looks.